My thoughts and beliefs through words and images. Some contributions by others. This was originally posted on The Coaching Fellowship and Trilogy Effect websites. Sleep eluded me! My mind and heart raced … new career, new city, new apartment … in reality, a new life. Overwhelmed, I found it hard to focus and couldn’t find my true north. That‘s why I applied to The Coaching Fellowship. The Coaching Fellowship pairs young women who are social impact leaders under 35 years of age with an experienced executive coach. During eight coaching sessions, we develop goals and a plan to work towards achieving those goals. I was matched with Wendy Appel, one of the founding partners of Trilogy Effect. Wendy is a boho-chic fashionista, avid traveler, and an executive coach for many Fortune 500 companies, and non-profits. Pro-bono coaching offers her the opportunity to give back and she tells me, is a great source of joy for her. Over the course of eight videoconferences, we opened many cans of worms. Recording sessions and rewatching them allowed me to study the lessons taught. The middle photo was when we finally met in person. I particularly loved moments of Wendy’s tough love, when she would hold up a mirror to help me realize my mistakes. Through the course of my coaching, I began to examine some of my closely held beliefs that affected how I saw the world around me and how I saw myself. I came to learn that, coaching is a process of self-transformation. Working with Wendy, my unconscious habitual patterns that got in the way were surfaced — especially my ability to focus — and I began the process of letting go of what no longer served me. I learned to build new muscles. When I read Wendy’s book InsideOut Enneagram: A Game-Changing Guide for Leaders, I began to understandthat my worldview was as ‘Type 2 People Pleaser’ in the Enneagram System. This knowledge and my approach had an impact on how I navigated at work, at home and in life. We did a session on career vision finding … many Post-It notes later, I was on track. My purpose as a leader is to use my hands, mind and heart to make a positive impact on society. I feel most in my element when I am encouraging other people. There are three intentions I have about having a positive “social impact”. One of my intentions is to inspire growth in our economy. This creates community, allows for more opportunities, and makes well-being a status quo. I will continue to bring my experience in design and education to take a deeper dive into the purpose of community, something I value and something I’m committed to. 2. Face conflict, don’t avoid it. Previously, I erred on the side of caution and didn’t want to rock the boat. Choosing to stay quiet to avoid conflict would often grow into resentment. When I embrace my discomfort and have the difficult conversations, I earn respect. I don’t waste precious time holding onto an upset and ruminating. 3. You have a choice. As a child, our personality begins to form. Some personality traits that are overused can become liabilities. Being a sweet ‘kind-hearted helper’ won’t help anyone close an investment deal. By understanding my behaviors on a meta level, I can make choices rather than operate on autopilot. By being more aware, I bring out other parts of myself that have been buried and undeveloped. 4. Embrace your core and focus on leading authentically. I have been the San Francisco ambassador of a global entrepreneurial community — Sandbox, since 2015. It was tough at first, but through coaching, I am coming into my own style of leadership. I lead naturally with curiosity and have learned to use to my strengths, encouraged by the positive effect I see. 5. Incredible things happen when women support one another. It’s heroines like my coach Wendy who remind me what’s possible when we stick together and help each other through transformation. 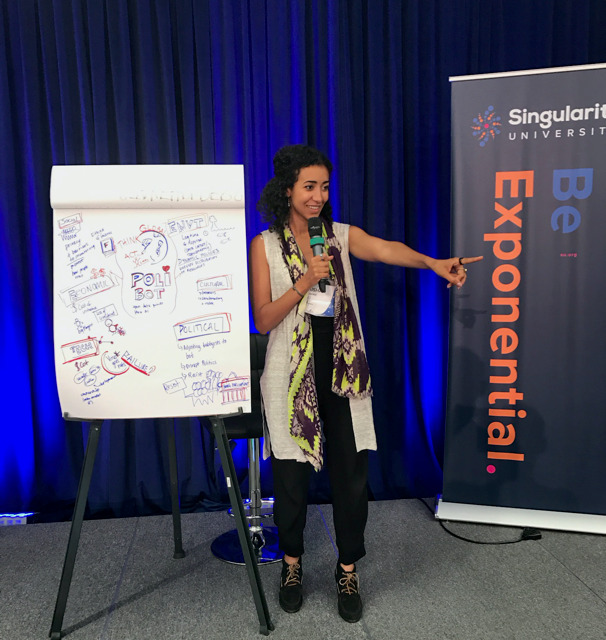 As a result of my work with the Coaching Fellowship and with their encouragement, I was recently accepted into the Global Solutions Program at Singularity University. I’m thrilled to be engaged with other incredible innovators from around the world for this rare opportunity. Together we will tackle a mega problem: Climate Change. Aisha Sheikh is a design & strategy consultant at Stanford ChangeLabs, educator at The Nueva School, and co-ambassador at Sandbox. She is a Third Culture Kid; originally from Mombasa, Kenya; raised in Toronto, Canada; and based in San Francisco, California. If this article speaks to you, consider being coached or being a coach, and donating to The Coaching Fellowship. You can make a difference in someone’s life and for the planet.